If you don’t like trivial indoor plants, HomeKlondike has a win-win option in stock – a tillandsia. Most commonly this plant is named an “airplant”, because it needs neither a pot, nor watering to grow. Tillandsia is an epiphyte, i.e. it grows attached to other plants. It doesn’t need direct sunlight – just create an environment that would be as close to its natural habitat – rainforest – as possible: diffused light and quite high moisture. 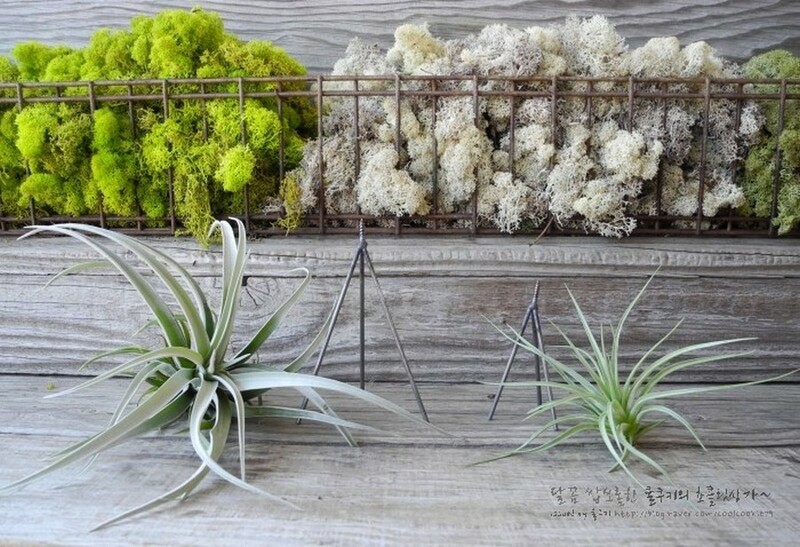 Unlike standard plants, an airplant gets nutrition from the leaves, so if you have dry air in your home, it should be sprayed with water every day. Despite the fact that tillandsia has no roots, it needs “home” anyway – some other plant, any organic backing, a tree bark, a branch, a moss or coconut fiber bedding. And we have 8 creative ways of growing this awesome plant at home. 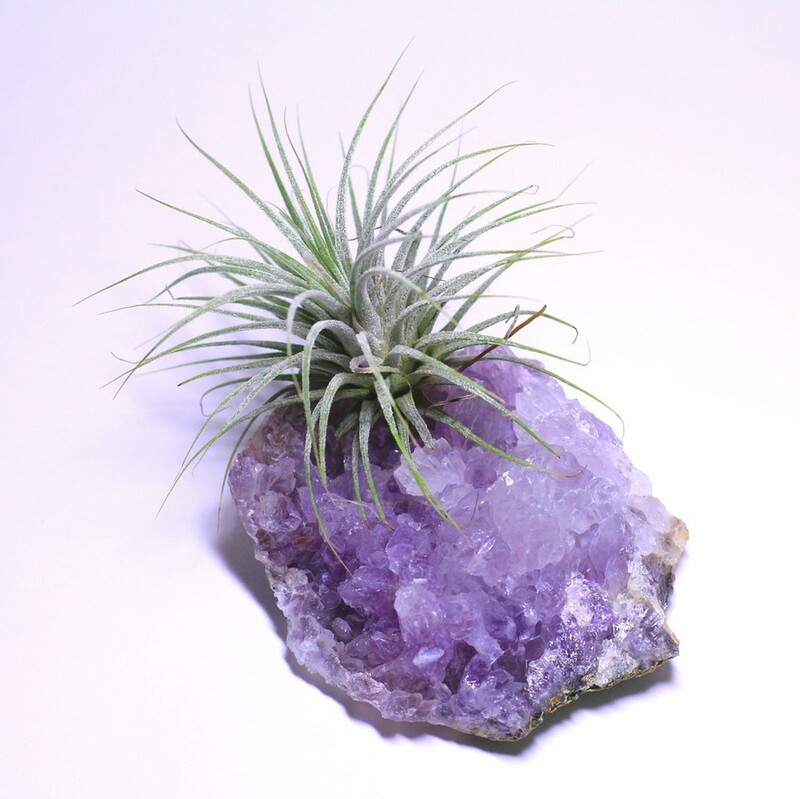 Decorators of Falcon and Finch suggest that you plant your tillandsia in a crystal. All you need is to apply some glue on a dry root and nail it to the crystal surface. One more option is a piece of wall art that you can make by yourself having some bark and an airplant. 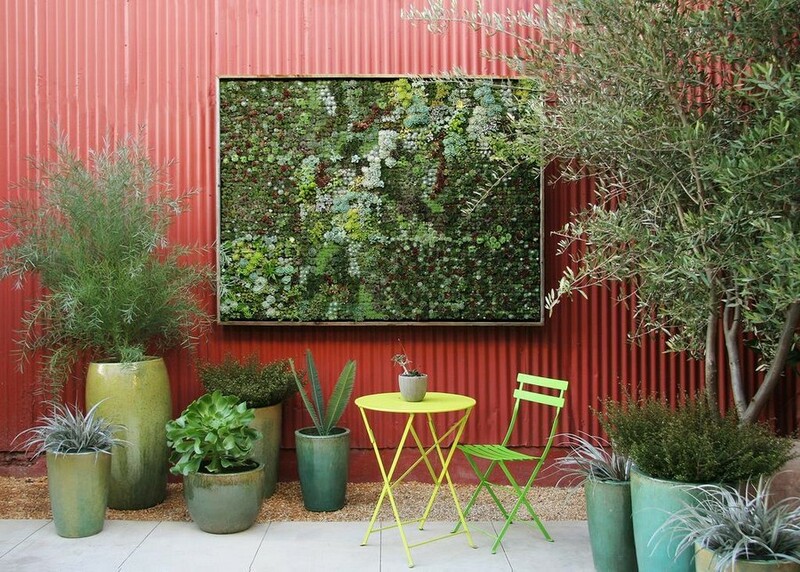 This amazing composition can be complemented with succulents, but given that they need soil to grow, you’d better not hang such a living picture above the sofa. A tree branch is also a good home for tillandsia. 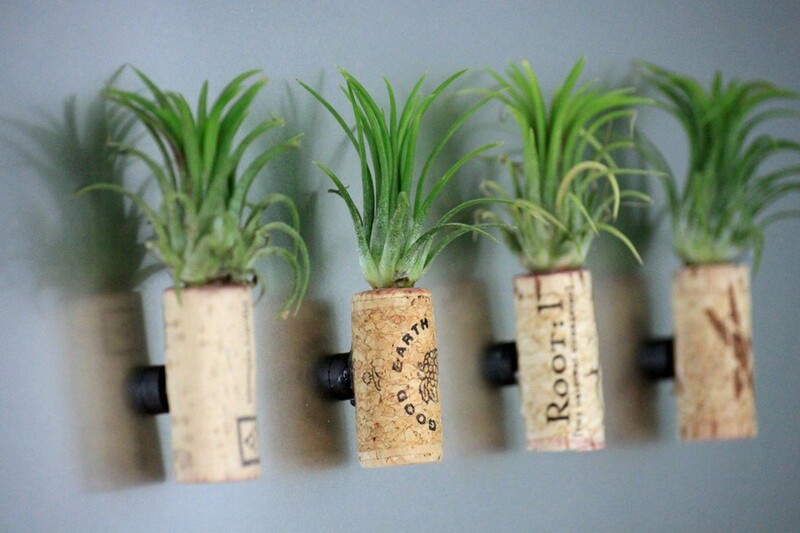 Wine corks are an original solution: make a small hole inside them and sit your airplants there. Corks can be put in a transparent vase or hung individually. Thereby you may safely put your tillandsia with the leaves down. Just wait a little before overturning the plant – it needs some time to strengthen and firm up in its new house. A trendy florarium can form a good habitat for a tillandsia. 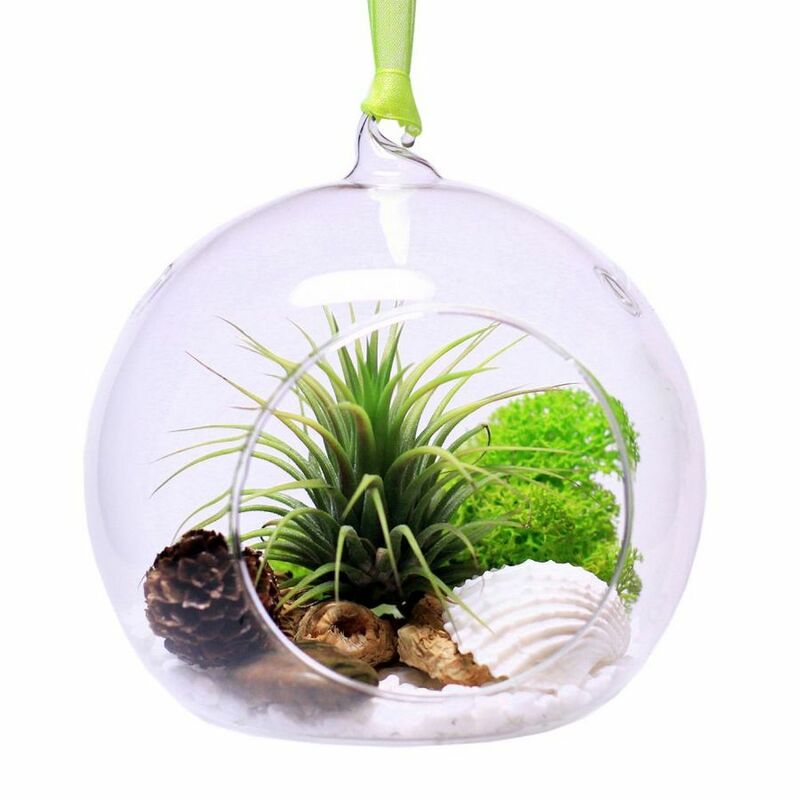 You may surround it with sea-shells, pebbles, decorative or wild moss, sand and pinecones. Tillandsia can easily grow in a sea-shell or a shell of a sea urchin. An especially spectacular couple will be formed by a shell and a Tillandsia caput-medusae species: it will look like octopus’s tentacles climbing out of a shelter. 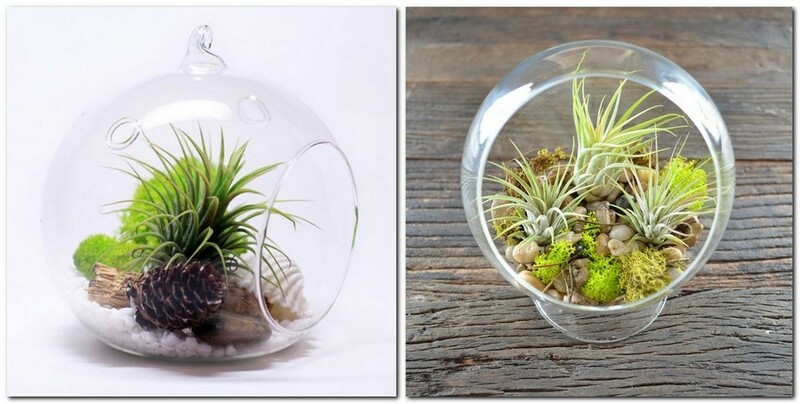 When housed in transparent glass vases, airplants will stretch their leaves up, creating the sense of zero gravity. This trick will bring airiness to the interior. If you use a tall vase, you may decorate its bottom with a pile of pebbles, which will accentuate the fragility of the plants. The same can be made in a wine or champagne glass. In fact, you are not obliged to limit yourself with transparent containers. Tillandsia can be grown in any piece of décor dear to your heart: a souvenir, an ethnic-style vase, a decorative plate, figurines, ceramic products, bottles and so on. 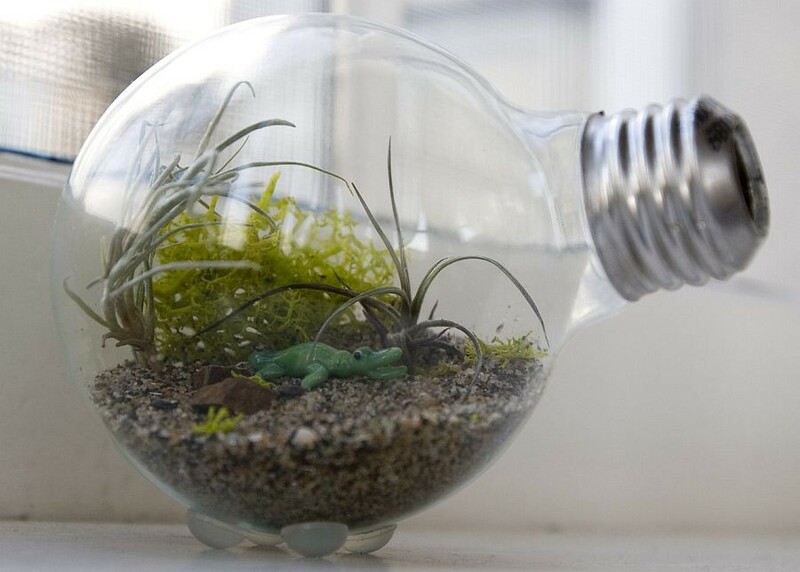 Even a common bulb can be a house for an airplant. Some companies manufacture special tripods for airplants and other aerophytes. The flower is then fixed in the bottom part, and the edge of the installation is fixed to the wall. One more option is to stretch a fishing line inside a photo frame and place a tillandsia between the strings. And this photo frame can be either kept on a table or hung on the wall.